The “Kisan Urja Suraksha Evam Utthaan Mahaabhiyan” Or KUSUM Scheme, announced in the Indian Budget 2018-19, will be placed for cabinet approval this month and is expected to be implemented by the first half of this year. The KUSUM Scheme will grant more than 50,000 crore government aid to encourage farmers to use solar power. 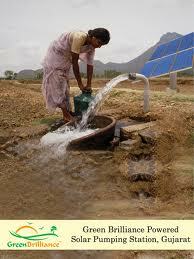 Solar power production of up to 28,250 MW can be achieved. The first part of the scheme will start with building 10,000 MW solar plants on land and providing 1.75 million off-grid agricultural solar pumps to farmers. The farmers can use their barren lands for generating solar power and can earn up to INR 60,000/ acre annually by selling the surplus electricity to state DISCOMs. This will provide an extra source of income to farmers who mostly live in hand to mouth conditions. They are also asked to use solar water pumps, wherein government will provide 60% subsidy which will be borne by Centre and States while 30% will be provided through bank loans. The farmers will only have to bear the minimal remaining cost. The implementation of the scheme is yet to be started. For the application, a dedicated portal will be designed in future where all relevant details regarding registration, eligibility, and documentation will be uploaded. Applicants will be required to fill a form and submit all relevant details. Not only will this scheme help to uplift the social status of the Indian farmers, but can go a long way in improving energy efficiency and water conservation. At present India has close to 10 million water pumps running on diesel. I disagree on the expected farmers earning by selling extra power to the Grid. In rural areas, the power supply is abysmally low and most of the times, the power supply is only during evening or night times. (Kusum Scheme) Haha Nice joke..
Ministry not check the feasibility before announce the kusum scheme. There are so many technical challenges which can not be overcome to make successful kusum scheme. I Want to instal 3hp agricultural solar pumpunder KUSUM scheme.so please inform the details to avail the opportunity under the scheme.and details and cost we paid for the hole set.my contact number is 9502748231.